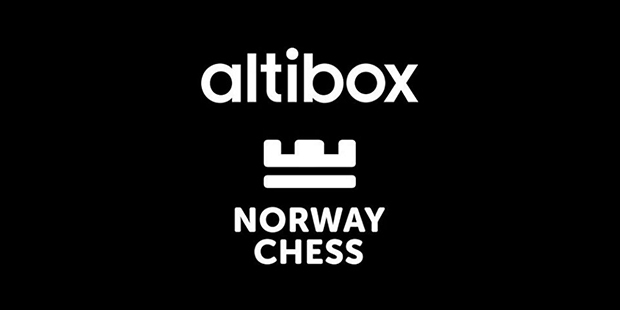 Round 6 of the Altibox Norway Chess Tournament, was played on Monday the 25th April. It was the last round before the second and final rest day. It was an exciting round, seeing two decisive games, but it could well have been four, with Magnus Carlsen and Veselin Topalov both having to defend their points. Pentala Harikrishna answered Anish Giri’s 1.e4 with the French Defence, and to be honest, turned it into the Indian Attack. Harikrishna’s 12…Nc6 was the novelty, already with equality and a nice potentially active position. Light-squared bishops were exchanged, after which Giri lunged on the Kingside with f4-f5 and Harikrishna countered on the Queenside with b6-b5. Textbook stuff, and there looked to be an exciting game in the making. Unfortunately, from the diagram position, (which shows the state of affairs at Black’s 14…b5), White’s game was about to take a turn for the worse. After 15.fxe6 fxe6 Giri’s 16.Qe2 was perhaps a little misguided. It hit the b5-pawn of course, but Harikrishna will have very happily played 16…Qb6, no doubt wanting to play it anyway. In effect, White had conveniently gone along with his opponent’s development plans. By contrast, his own development needs a little attention, with a knight sitting on d1. All of a sudden, Black was looking rather potent there on the Queenside and would most likely be the happier of the two from the opening. After 17.Nf2, Black was in a good position to push with 17…a3 and this he did, seizing the initiative. Some liquidation followed, and this saw Black with an isolated Queen’s pawn, but very nice piece activity, (including a lovely Knight posted on e4), which kept White on the back foot. The diagram, above, shows the position, and at first glance it doesn’t actually look too serious. Well, it didn’t to me, anyway. However, White is just not active enough, infact, as things stand, he only has Queen and Knight to play with – plus his e-pawn, which is passed but not a serious threat. Meanwhile, Black has all of his pieces involved in the game, and for this reason is very much in command, here. That d-pawn of his is going to need constant attention. And this was shown in the way that Anish Giri’s game went rapidly downhill from here. Alarmingly, Giri had not played what one could call ‘badly’ in this game, it was more a case that he had been out played by his opponent, who soon found himself with a winning advantage. Harikrishna’s pieces ran rings around those of his opponent and he soon had yet another full point on the board. Former World Champion, Garry Kasparov, made an interesting point following this game. The chess legend, was quoted by Chess24 on Twitter, speculating that Giri was still being haunted by missed chances in the Candidates Tournament in Moscow. I see his point, though I am not sure that Giri actively sought all that many chances, I have to say. However, whether his full house of draws was by accident or intention, the Dutch Grandmaster seems to have lost some sparkle. I am sure that this is a temporary thing, however, and that Anish will soon bounce back. Hopefully Tuesday’s rest day will do him good and he can come out for the last three rounds a bit more like himself. Activity (or lack there of) was also the problem for Nils Grandelius, as his horrid time in Norway continued at the hands of Pavel Eljanov. Grandelius, (who has lost four of his six games), played the Black side of a Grunfeld, and though his pieces were developed, White’s were developed better. It was a case that they were just doing more. This being said, Black managed to hold things, aided a little by White, who seemed to faff around a little either while trying to decide on a plan forward or wanting to consolidate. The problem with consolidation, is that it can be overdone, and White’s initiative evaporated. Then, as can be seen in the diagram, above, Black won what looked to be a safe pawn. After 29.Nf5, Black of course had to be extremely accurate, and luckily was. There followed 29…gxf5 30.Bxf6 Qa3 31.Bxg7 Kxg7 with equality. After 32.e5 Rd8 33.d6 Black’s 33…Qb4 was perhaps a little too quiet, (…exd6 was a little more in White’s face), and allowed Eljanov to set a trap with 34.Kh3! This is one of those moves that appear deceptively quiet, but tip the balance in a very big way. White removes Black’s threat of taking on d2 with check and threatens Qh5, which is very serious – even more so because it is not something that can be stopped. There is also the additional possibility of Rb2, which is also quite a concern as things stand. In other words, Black had problems, the question was whether they could be solved with one move. Grandelius chose 34…exd6 which wasn’t good enough, but then again little was. 34…Rd7 was the best try it seems. A possible continuation would have been 35.Rd5 when …Qe4 should hold – for example, 36.Qb5 Qf3 sees White having difficulties progressing (Qxd7 would lead to perpetual after …Qg4+). Grandelius will be a little disappointed at missing this. After 34…exd6, Eljanov continued with 35.Qh5! From here he had the position under control and Black was helpless. The other games were drawn, but by no means dull. 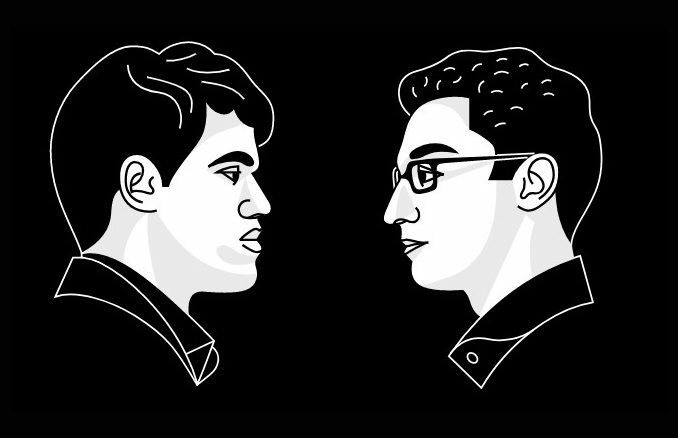 Maxime Vachier-Lagrave is playing some very bold and interesting chess and no matter how he gets on in this tournament, he will have won admirers. In this round, he gave up a pawn in order to have a go at Magnus Carlsen. 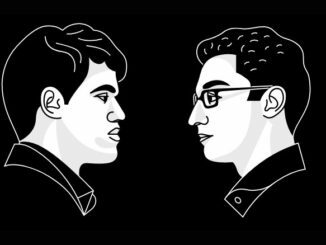 The game followed Giri-Karjakin, from the 2013 FIDE Grand Prix in Beijing, (won by Karjakin in 42), until Carlsen deviated with 21…Nd5. Karjakin, (his challenger for the World Championship of course), had played 21…b5, also a very respectable move. Vachier-Lagrave obtained a very nice game and really had the World Champion in some trouble, it must be said. Such was his discomfort that he took the decision to sacrifice the exchange with 31…Bxg4. And Carlsen did indeed manage to swing things, obtaining very nice activity for his piece and a passed pawn on the Kingside. In a position of equality, the players repeated. It was a very nice game, this, a very tense affair and one in which Carlsen was the closer of the two to dropping a point. Li Chao and Veselin Topalov got in to a sharp Semi-Slav. Ultimately it was White who got the best of things, but Black fought extremely well and was active enough to make things less than straight forward. The quietest game of the round was Kramnik-Aronian. It was a Giuoco Piano which didn’t really see much event. This sees Magnus Carlsen retain his half point lead, while Pentala Harikrishna leaps right in to the thick of the standings, thanks to his back-to-back wins. Play resumes on Wednesday, three rounds remain. Play begins at 16:00 local time. If you need to, you can check your time, here. Tradewise Gibraltar Masters 2017 RD 1: Favourites Off To Good Start!